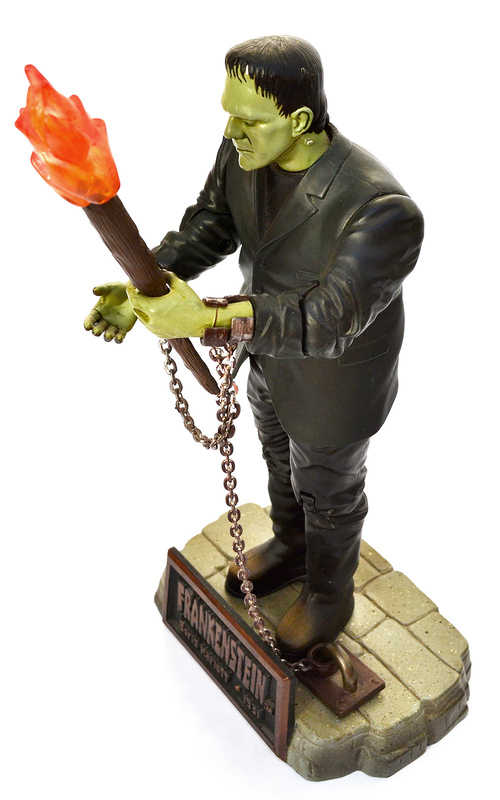 Universal Studios Monsters: Frankenstein action figure by Sideshow Toy (1999) | 'TAIN'T THE MEAT… IT'S THE HUMANITY! Released by Sideshow Toy these nine-inch tall action figures featured some of Universal Studios most iconic monsters from the 1930’s and 1940’s. Dracula, Frankenstein, The Mummy, The Wolf Man, The Phantom of The Opera, The Invisible Man and The Creature from the Black Lagoon were just some of the 15 action figures released in five batches by Sideshow Toy between 1999 and 2001. Of all the action figures in my collection these Universal Studios editions rank amongst some of my very favourites, and over the few months I’m going to take a closer look at those in my collection. The back of the Frankenstein blister pack. 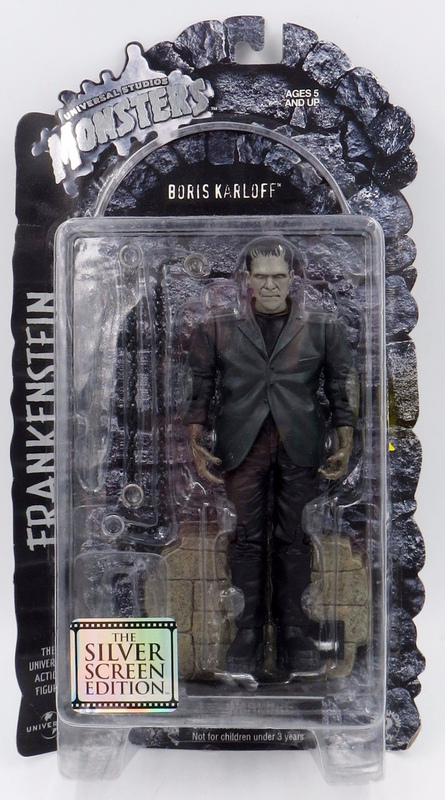 From the first ‘series’ of figures (released in 1999) came Frankenstein, immortalised by Boris Karloff in the 1931 film of the same name. When released the James Whale directed movie, based on Mary Wollstonecraft Shelley’s famous novel, was a huge hit for Universal and made Karloff an overnight sensation, even though the actor had already appeared in over 70 films. Karloff’s sympathetic and pathos-driven portrayal of the creature has since become definitive, and although the character has appeared in over 150 films since the release of the original his portrayal of the creature has never been surpassed. 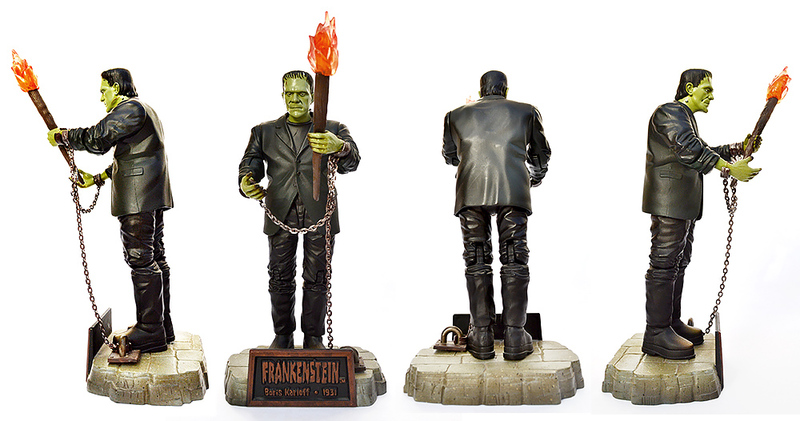 The Frankenstein action figure measured nine inches in height (that’s when measured from the base to the top of his head — the figure is a lot taller if you include the torch he’s holding), was moulded from heavy duty plastic and featured 12 points of articulation. 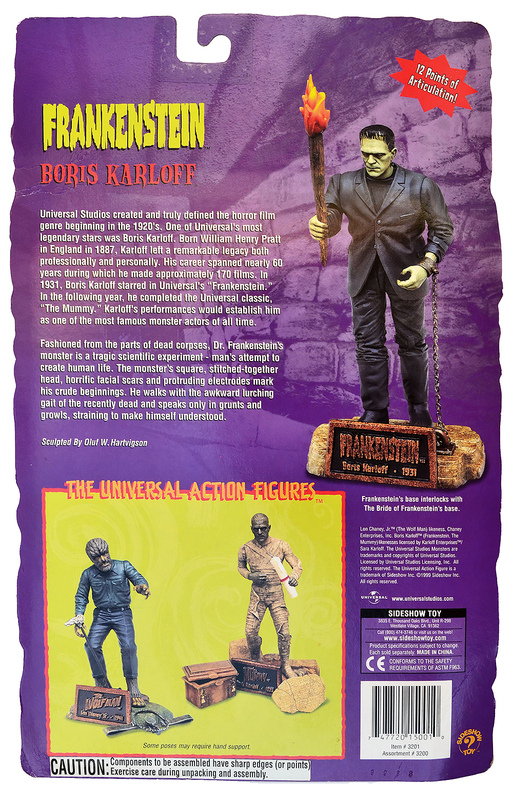 The figure came with a base that featured a name plate with the movie’s legend, as well as Karloff’s name and the release date of the film. Also included was a flaming torch (although I’ve always been a little perplexed to why as the creature in the film was terrified of fire) and two lengths of chain that can be fitted around the creature’s wrists and attached to a ring in the base. The figure shipped in a full colour cardboard-backed blister pack that featured biographical details of the creature on the reverse, and highlighted the other two figures in the first series: The Wolfman and The Mummy. A close up of the name plate on the base. The creature’s iconic neck bolts are clearly visible. The action figure was sculptured by accomplished artist Oluf W. Hartvigson, who has created action figures and statues for Star Wars, Marvel Comics and The Lord of the Rings. Hartvigson did a great job on this action figure — the face is an accurate rendition of Karloff’s iconic makeup and the level of detail is very high (even the creature’s famous neck bolts are clearly visible). The figure is well painted and there’s some subtle colour shading on his boots and on the base. 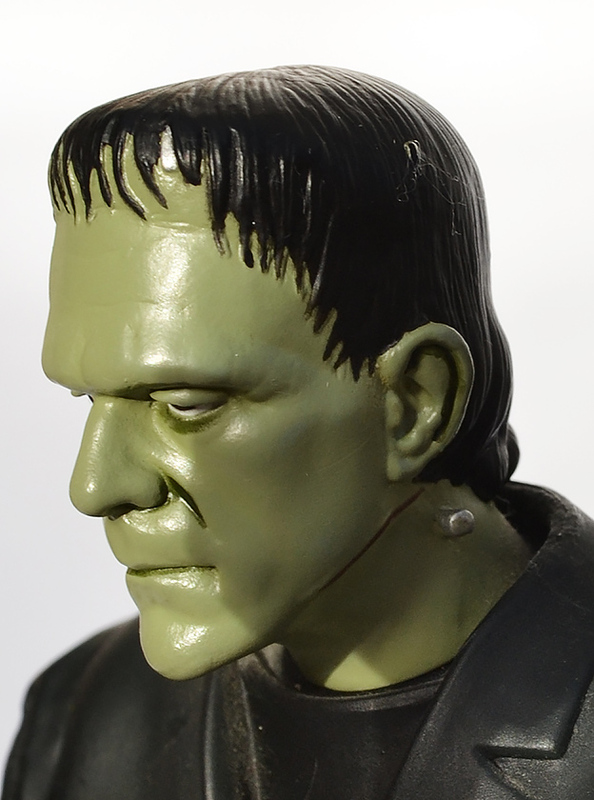 Along with the colour version of this action figure — and in an attempt to evoke the vibe of the original black and white movie — Sideshow Toy also released a ‘Silver Screen’ edition of Frankenstein, which was the exact same action figure but reproduced in shades of grey. Personally, although I appreciate the idea behind the black and white edition, I much prefer my colour version. (A rather naff ‘glow in the dark’ edition was also released, but it looked horrible and the less said about it the better). The Silver Screen Edition of Frankenstein. 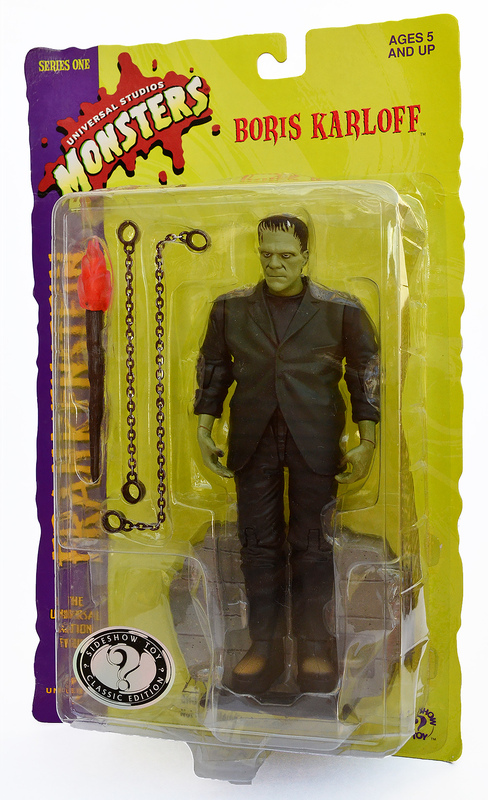 It’ll come as no surprise to learn that, due to it’s age the Universal Studio Monsters/Sideshow Toy Frankenstein action figure is now well out of print. The occasional copy still comes up on eBay but they’re not cheap, with prices ranging from a fairly reasonable £30/$40 to a far more unreasonable £100/$130 (which makes me glad I picked up mine for £15 when it was released). Over the years my copy of this statue (and the others in the collection) have held pride of place in my collection, and for a while they even adorned my mantlepiece. Next up: Lon Chaney, Jr’s The Wolf Man.